From 2012 through 2014, the widest U.S. corporate profit margins in many years caught the attention of everyone from investment strategists to religious leaders. Unfortunately, the abundant public attention did not lead to enlightenment but to the spread of misguided conventional wisdom—both empirical and conceptual—concerning aggregate profit margins. Misconceptions about profit margins arise not only because people look at the wrong measures, but also because most people harbor fallacious notions about what determines aggregate margins and what changes in margins imply. Treating profit margins as an independent random variable, many people blithely assert, “Historically, margins tend to revert to the mean.” A casual perusal of the historical record shows that margins fluctuate along with the business cycle and that the average margin in any decade can deviate substantially from the postwar average. Moreover, margins once remained consistently lower than their post-World War II average for nearly 20 years. This is not the behavior of a simple random variable. The chart above also defies the theory, “Margins cannot remain abnormally wide for long because the excess will be competed away.” The influences on aggregate profit margins are different from the influences on the margins of individual firms. 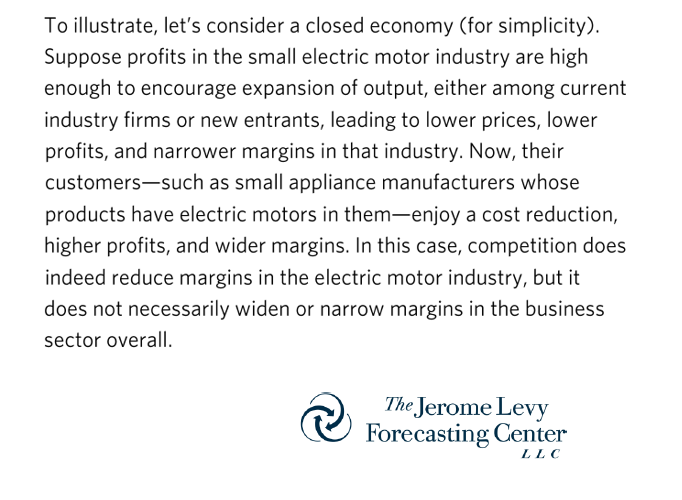 Although competition can compress fat profit margins in a given industry by increasing supply and driving down prices, aggregate profit margins are not “competed away” in the business sector as a whole. The reason is that if increasing competition in one industry reduces prices, profits, and profit margins in that industry, profits will necessarily rise in other industries unless the profit sources change. Everybody knows that reducing labor costs directly augments a firm’s profit margins and that rising labor costs take a bite out of margins. After all, people see these effects all the time in their own businesses. Labor costs go down, and, all else equal, the savings from this cost reduction go right to their bottom line. 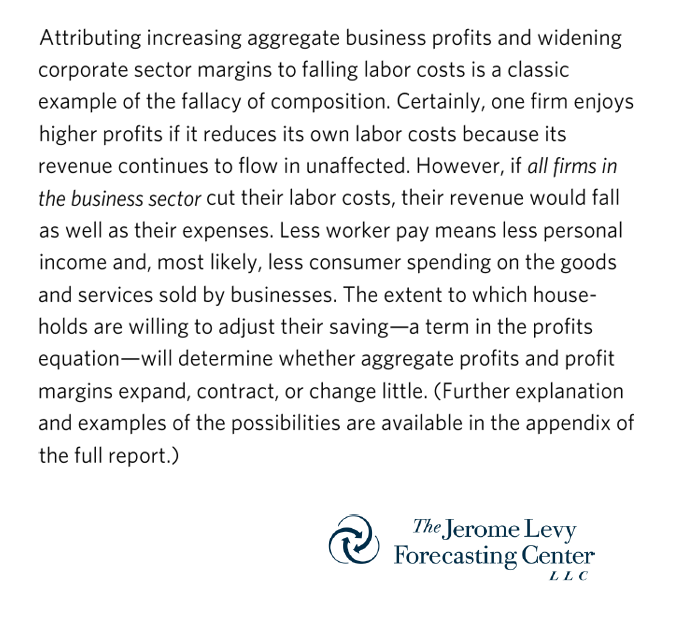 So, when labor costs are falling throughout the economy, most people assume that for the entire corporate sector, aggregate margins are widening and aggregate profits are benefiting accordingly. But they are generally wrong. Indeed, most of the time aggregate labor costs and aggregate profits move in the same direction; measured in dollars, both tend to accelerate during expansions and decelerate during recessions (as seen in the chart below). 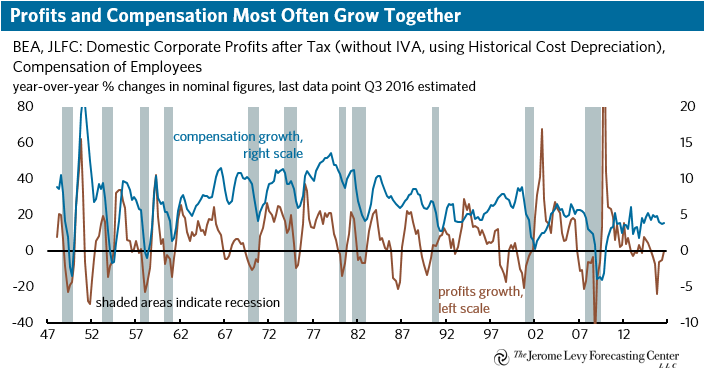 The big difference is that the cyclical swings in profits are proportionately greater (and tend to begin somewhat earlier in the cycle) than those in compensation. Generally, the owners of capital and workers experience more or less together the improving or worsening of conditions that come with the business cycle. In the event of an economy-wide acceleration in wage inflation, do not assume this would be bearish for business. Market Mechanisms Distribute Profits among Firms and Industries, but the Profit Sources Determine the Magnitude of Aggregate Profits. The many influences on—and interactions among—the profit sources along with the many factors that affect household income growth simultaneously determine profits, revenue, and margins. Moreover, since profits are more volatile than revenue, profits are virtually always involved—indeed, dominant—in any major short-term widening or narrowing of aggregate margins. In short, the profit sources determine profits, and profits are the most critical determinant of profit margins. Jerome Levy (1882-1967), the first person to derive the aggregate profits identity, devised an analogy to illustrate how competition, micro profitability, and macro profitability all interrelate. Imagine a class for school children in which prizes are periodically awarded to students who perform best on various tests and assignments. The best competitors—the smartest, hardest-working, and quickest kids—will undoubtedly win the most prizes, but the total number of prizes is beyond any student’s control. Similarly, firms and industries compete for the profits available in the economy, and the best competitors will profit the most. 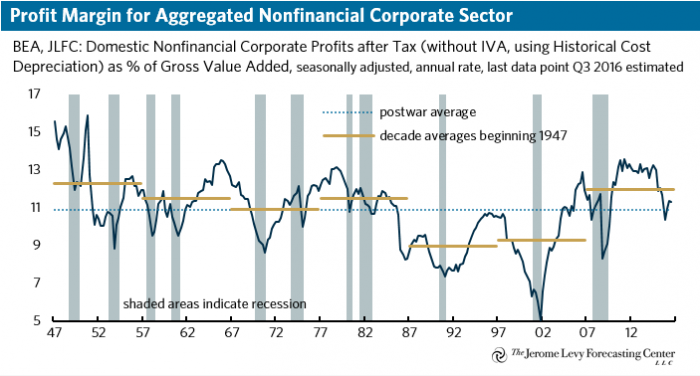 However, no firm or industry has any control over whether aggregate profits will be high, as during a strong expansion, or low, as during a recession. For more charts, analysis, and myth-busting about corporate profit margins, download the full report.